Around the turn of the century, British explorer Percy Fawcett journeyed to the Amazon to map the area and found evidence of a previously undiscovered civilization. Despite his peers’ lack of support and the harshness of the rainforest, Fawcett was compelled to return to learn more about his treasured jungle. Based on a true story and bestselling novel, The Lost City of Z is more than an action-filled adventure. It also showcased the norms of the time like class distinction, honor and chivalry. 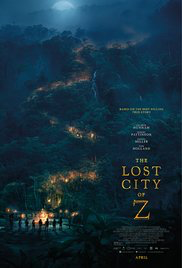 If you’re in the mood for an educational thriller, I recommend seeing The Lost City of Z.